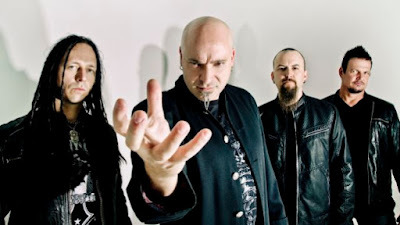 MetalRockNews: Disturbed's David Draiman on his decision to delete his Twitter account: "I'm done being anybody's punching bag"
Disturbed's David Draiman on his decision to delete his Twitter account: "I'm done being anybody's punching bag"
Disturbed frontman David Draiman was interviewed by Motley Crue and Sixx A.M. bassist Nikki Sixx on Sixx Sense, you can read some excerpts below. About new album "Immortalized": "We definitely wanted to expand stylistically and sonically; that's part of why we sought out working with a producer this time. And that in and of itself was quite an interesting journey. Thankfully, we've been blessed with tremendous success and an amazing, dedicated fan base that has kept us strong. And we're in a position where we were able to at least have conversations with some of the most talented, creative minds in the industry. And we sought out who we would have the best creative chemistry with as a producer. And we spent some time with Bob Rock and Rob Cavallo and just some amazing, amazing people. And we ended up going with Kevin Churko. Not because, specificially, Kevin is more brilliant or less brilliant or whatever, all these guys are brilliant and they all have tremendous things to offer to anybody, but with Kevin we just happened to have a more natural chemistry; it happened to flow a little bit easier, we felt the most relaxed and the most comfortable. So it kind of started from there. Another factor in this is that we have... The first time since the 'Believe' record that every single one of the writing sessions happened with myself, Dan Donegan and Mike Wengren, all in the same room together writing; we didn't rely on technology. We didn't send MP3s of Wave files from Austin through Chicago to Milwaukee and back and forth. We created everything in the same room. We did wanna push the musical envelope. We did wanna show different things, stylistically, and we made a conscious effort to do so. And 'The Vengeful One', to be honest, is probably the one that is still the most true, that and the title track, 'Immortalized', are the most true to the steterotypical Disturbed sound. Wait until you hear some of the deeper tracks on this record. It really goes through some left turns, that's for sure." About his decision to delete his Twitter account, Draiman said: "I'm done. Done with social media. Done. Because... you know, I invested two, three years… maybe more… three, four years of solid interaction, of trying to make a differerence, of trying to be a voice of reason, of trying to be something entertaining for people. And the Internet, sadly has become a preying ground for trolls and just predators. And when you're in the position that I'm in and you have a wife and a child who had just come into this world not too long ago, you start wondering whether or not that continued interaction and some of the threats and some of the nonsense are worth it. And you wonder whether or not what you're saying is actually really making a difference. I was never the guy who was going to try to use my social media to be a source of promotion for myself, even though I know I'm supposed to; it's never really been my thing. It was always trying to use whatever kind of a voice in the position that I have been blessed with for good. To be able to try and educate people a little bit, make 'em laugh a little bit, make 'em open their eyes a little bit. And it just didn't seem to be making a difference. And I kind of spent enough time on it. It was taking away from my marriage, it was taking away from my time with my kid. And I'm, like, 'You know what?! At the end of the day, what the fans want from me is to get up there on that stage, wield that microphone and to make them feel powerful and to give them a release and to make them forget about their troubles for an hour and a half or two hours. And as long as I'm still doing that, hopefully they'll still be happy with me. I'm done being anybody's punching bag." Metallica's Lars Ulrich: "The new album will be done this summer"
Metallica drummer Lars Ulrich was recently interviewed by Metal Forces , you can read some excerpts below. Below Sid Wilson's photo on a speedy recovery. Waiting for updates. Disturbed's David Draiman about his son: "I certainly have become even more defensive of a very, very menacing world"
Disturbed singer David Draiman was recently interviewed by Arte, you can read some excerpts below. Disturbed frontman David Draiman was recently interviewed by Live Nation TV, you can read some excerpts below.